[Ottawa – June 7, 2014] – The Progressive Conservative surge of yesterday appears to have halted and our three-day roll now finds them in a statistically insignificant lead, but trailing on likely voters. More notably, the large single night lead which vaulted them back in to parity in the race does not appear to be continuing. The race is now basically tied and the outcome remains highly uncertain. The very large bump that disrupted the stable Liberal lead appears to have dissipated and, in fact, the Liberals enjoyed a modest lead last night. The net result is a basic tie with no clear winner in view. Although it remains to be seen what will happen, it is possible that the effects of a sound debate performance are receding and the voters are reverting to their positions going in. This would not be uncommon but it is far from clear what will happen from here. The demographic and regional patterns have remained largely consistent from our last poll. 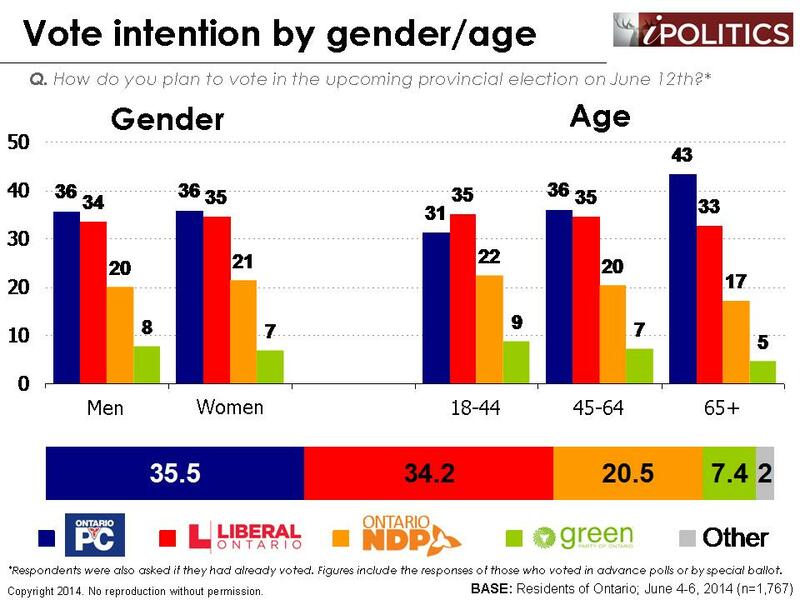 Interestingly, the Liberals and PCs are now statistically tied among women, a notable shift from the early stages of the campaign when the Liberals consistently enjoyed a 10-15 point lead with this group. The PCs are very strong in Eastern Ontario, to the point of possible overkill in terms of seat efficiency. 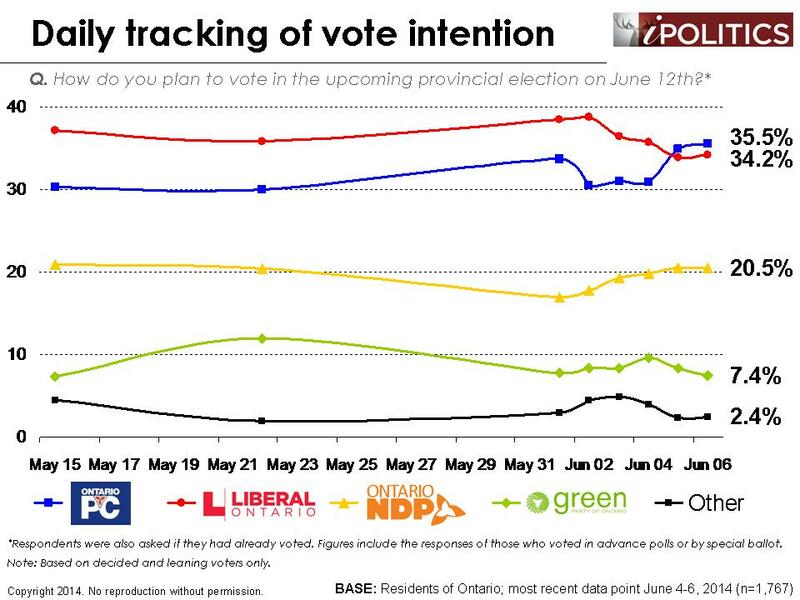 The bottom line is that we have a highly uncertain and close race, but the momentum of the PCs appears to have halted, and maybe reversed. 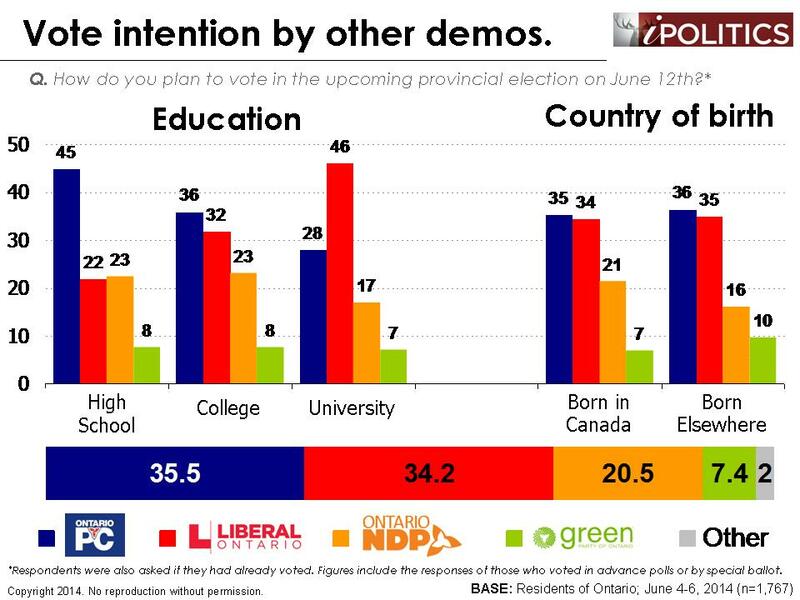 In terms of those most likely to vote, the Ontario Liberals seem to have the upper hand but we will reserve further prediction speculation until we see the results of the next few days. The picture is, however, very different today than it was yesterday. 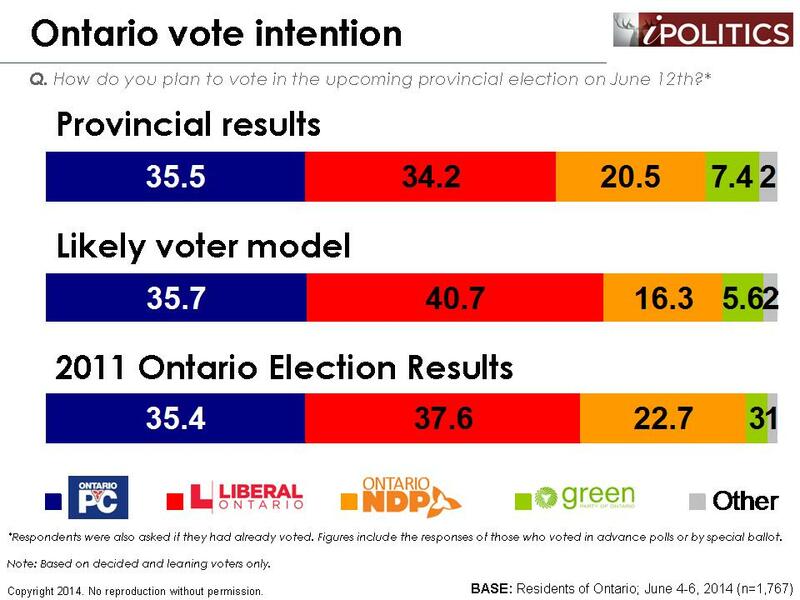 If we see continued positive numbers for the Ontario Liberals tomorrow, we would be tempted to go back to our earlier prediction of victory for Wynne. Given the fluctuations of the last two days, we will opt for a more circumspect approach and put bold predictions in abeyance for a day or so. The field dates for this survey are June 4-6, 2014. In total, a random sample of 1,767 Ontario residents aged 18 and over responded to the survey (including a sub-sample of 1,484 decided voters). The margin of error associated with the total sample is +/-2.3 percentage points, 19 times out of 20.